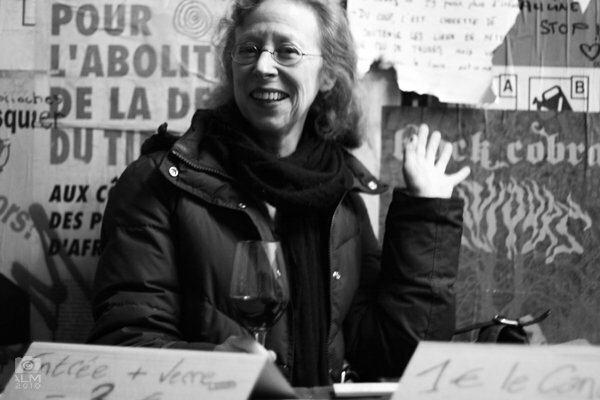 This week’s featured writer is inimitable wine writer Alice Feiring. I’m thrilled that she’ll be reading at Drink.Think again. Last time, we got a sneak peek of her then not-yet-published book Naked Wine. I can’t wait to see what she has on tap for us this time! Writing professionally since 1988, Alice is the winner of both the James Beard and Louis Roederer Wine Writing Awards. In 2013 she was named Imbibe Magazine’s wine person of the year. Her blog, The Feiring Line has been named by Food & Wine and Forbes as one of the world’s top wine blogs. Finally, in 2012, she launched a paid-subscription newsletter The Feiring Line, the real wine newsletter. This is the only independent newsletter that focuses on wines that are organic, biodynamic and natural. Her last book, Naked Wine, letting grapes do what comes naturally (DaCapo Press, 2011) chronicled personal adventures in the natural wine world and followed on the heels of her 2008 controversial volume, The Battle for Wine & Love or How I Saved the World From Parkerization. Come sip some vino at Jimmy’s 43 on Tuesday, December 3, and listen to Alice read from her work. This entry was posted in Featured Writers and tagged Alice Feiring, author, beverages, drink writers, Drink.Think, Jimmy's 43, literary, Naked Wine, New York, reading event, wine, writer. Bookmark the permalink.